Practice finding letters with this easy, no-prep letter recognition printable. Letter recognition is the foundation of reading. If a child cannot recognize letters then they will struggle with recognizing sight words and sounding out CVC words. 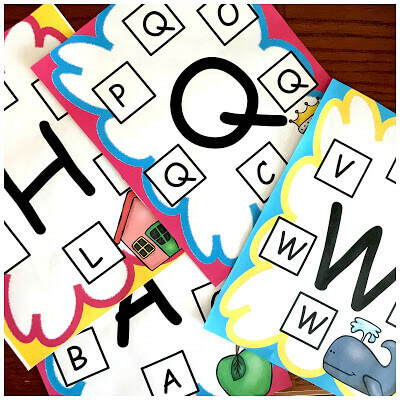 These printables allow the children to practice recognizing letters, and with your help practice the sounds each letter makes. So this printable requires almost no prep-work. First, print off the sheets. Then find some snap cubes or other game markers. Finally, sit down with your preschooler or kindergartener and you are ready to go. There are many different ways you can adjust these letter recognition printables to meet the needs of your kiddos. If you have a child that know their letters and their sounds then you can allow them to do them independently. Simply hand them some snap cubes and the sheets. Have them say the letter in the middle of the sheet, and then its sound. Next, have them place a snap cube on each letter that matches the letter in the middle. Each time they put the cube down, have them say the letter and the sound. 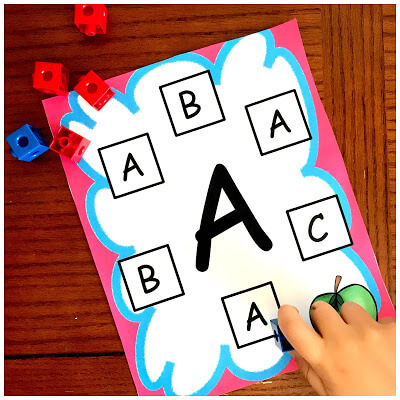 If your child is still learning their alphabet, then you can use these printables for instruction. Let’s say you are working on the letter W. You could begin by pointing to the letter W, and saying the letter as well as the sound. 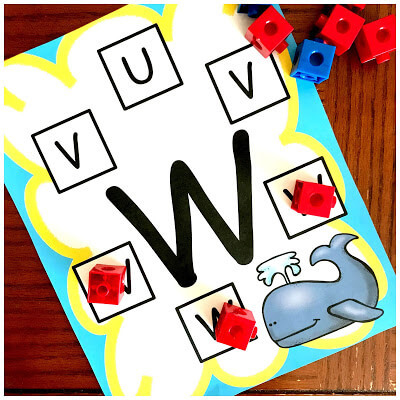 Your next step could be to point to the V and once again ask if it a W. Whatever their answer, you can once again respond by explaining and showing them why it is not a W.
Work your way around the printable, doing the same thing until you have talked about each letter. Teaching letters and seeing little one learn their letters is such a special time. And if you need more letter recognition ideas here are some that might help. This is awesome! Is there any chance you would be willing to make one with lowercase letters?